The K-101 MOD from Kamry is a telescoping Mechanical MOD a state of the art using the vivi nova clearomizer that gives you mouthfuls of vapor and so much delicious flavor. The viv nova has a 2.8ml tank that allows for hours of vaping and is 510 threaded so you can switch and use them on any of your eGo batteries also. Another great feature is that it is rebuildable. Once your wick is burned out, just unscrew the wicks from the base of the clearomizer and replace with a new wick. Not only that, it is customizable; choose from an array of colors and replace the black drip tip with one in a multitude of different colors. The ViVi Nova is a fantastic addition to the K101 Mod. Not only does it come in colors that are complimentary to each other, the size of this clearomizer makes the overall look streamlined and classy. You’ll wow your friends and impress your co-workers when you bring out this all around great MOD and its fancy associate the ViVi Nova. The all metal construction and chrome finish with color accents makes the K-101 a real eye-catcher. 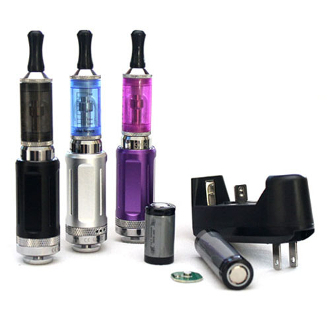 The K101 has a 510 / eGo threading for use with almost any atomizer, clearomizer or cartomizer with 510 or eGo threading. This unit is completely mechanical which means it doesn't have any built in protection circuitry. Please be careful when using this product. We will not be liable for any damage to Clearomizers, cartomizers, batteries etc. A kick chip can protect the battery from short circuit. It also can avoid the overheating of the batteries and provides over current protection. Do not over-discharge/overcharge - Recharge empty batteries (resting voltage ~3.6V) as soon as possible. Leaving batteries in discharged state can/will cause irreversible damage not covered by a warranty. Don't leave batteries in Vehicles. Don't carry batteries loose in your pockets, purse or anywhere they can make contact with other metal objects. Don't leave batteries alone while charging. Avoid over tightening, when screwing together the device. Make sure that you're only screwing the battery cover tightly enough to the point where the battery doesn't rattle around. Over tightening of the Mechanical Mod may cause the unit to continuously fire unintentionally and could damage the battery or internal components.